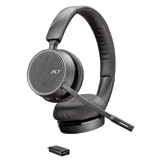 Plantronics Voyager 4220 USB-C Bluetooth stereo headset with BT600 USB-C Bluetooth adapter. Plantronics Voyager 4220 USB-C made for the smart device with the new USB-C ports. The Voyager 4200 series are Bluetooth USB headsets with class 1 (100ft) Bluetooth range with the Bluetooth BT600-C adapter (included). Noise-canceling microphone blocks unwanted background noise for your phone calls. Compatible with PC and Mac platforms.